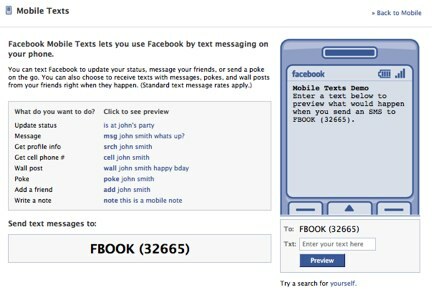 It appears that over the past few weeks, Facebook has widely activated a feature that allows you to text Facebook to update your status, message your friends, or send a poke on the go. 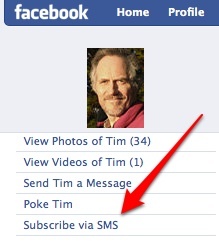 You can opt to receive texts with status updates, messages, pokes, and wall posts from selective friends right when they happen. 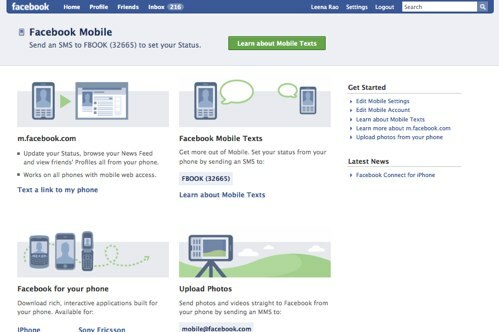 This is all part of a larger Mobile strategy that Facebook has begun to promote actively on its Mobile page. This is just another example of how Facebook is trying to be more like Twitter. Twitter has always let users send and receive Tweets via SMS. In fact, originally, Twitter was designed for integration with SMS, hence the 140 character limit. Facebook recently redesigned user homepages to look and feel more like Twitter, adding real time-support and a tweaked interface. UPDATE: I was mistaken, the SMS feature is not new but the mobile landing page that packages all of Facebook’s Mobile offerings is brand new. Because of this addition, its only now that people are beginning to realize many of these mobile features even exist. Hat tip to Patrick Hawkins.